After last game where Andrew used the Skitarri list we swapped over and I gave it a try. I had been rather vocal on Tactical Command forums recommending that the Quake Cannon Ordinatus should cost more points and thus we thought we would try them at the suggested 600 rather than 500 points in this game. 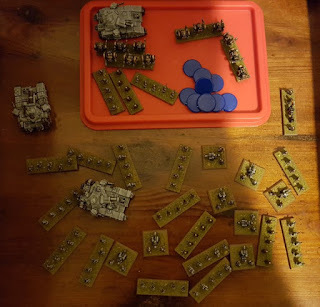 Similarly I used the Golgotha which is another war engine macro artillery formation (though more limited in that it will have probably run out of ammo by turn 4), at 550 rather than 500 points. 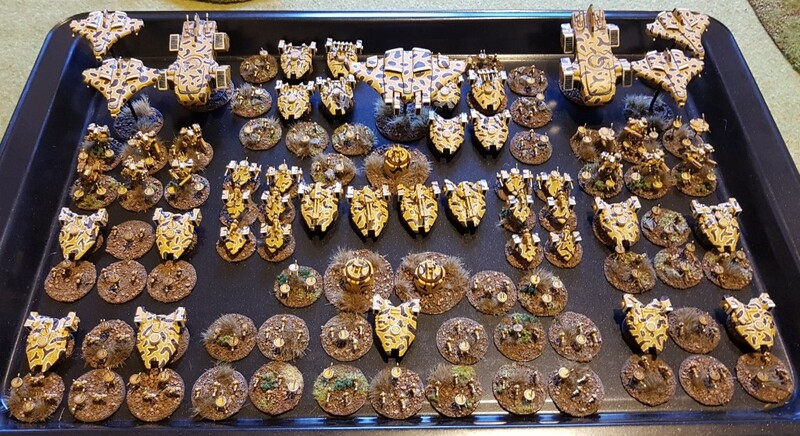 For this game I used a mix of Imperial and Chaos war engine models and infantry, though I did actually have one of the Ordinatus style models from Vanguard for the Majoris! 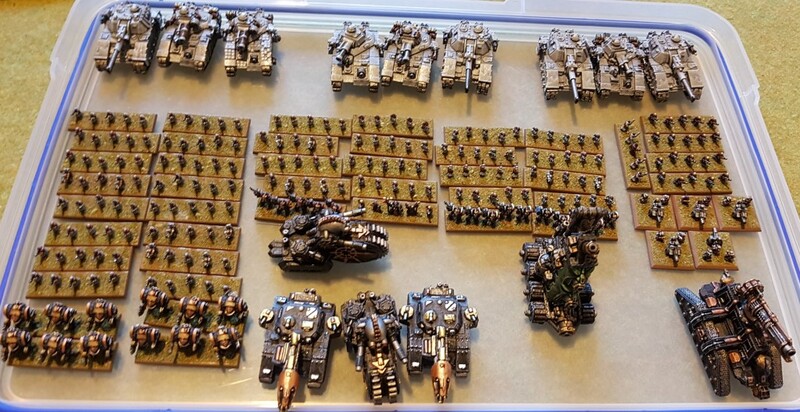 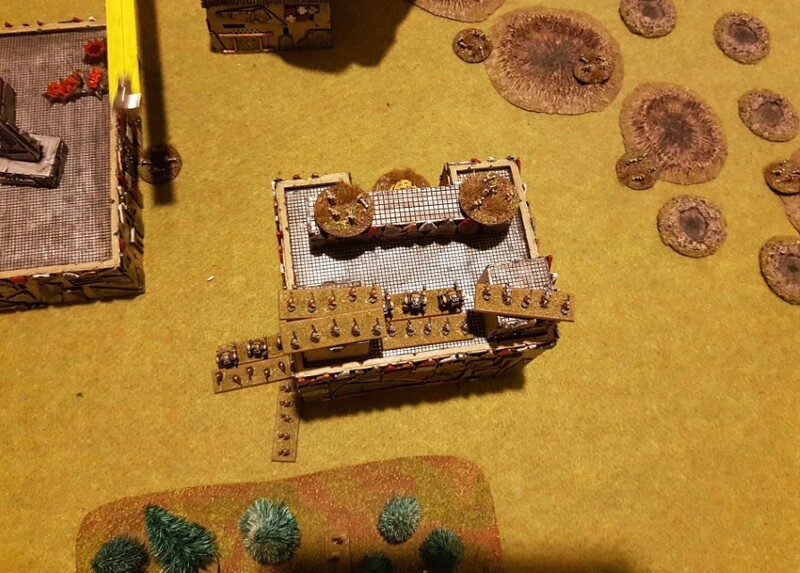 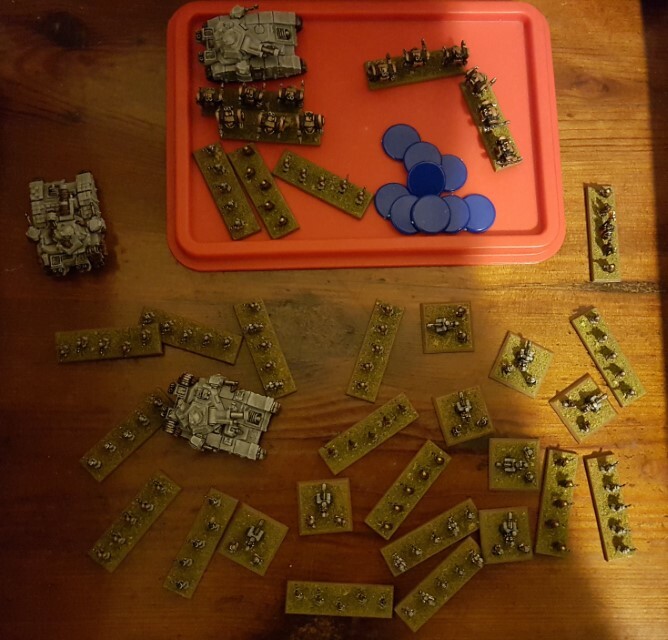 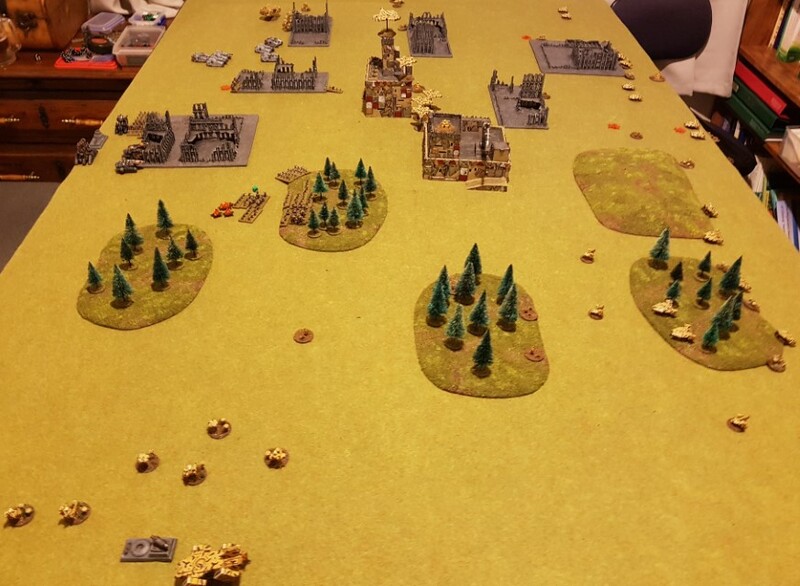 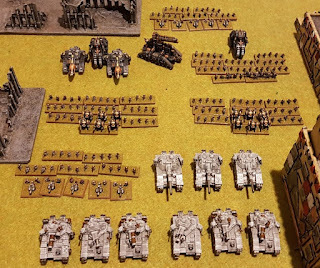 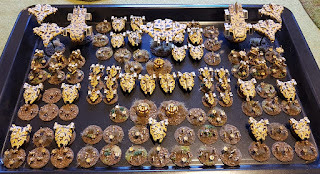 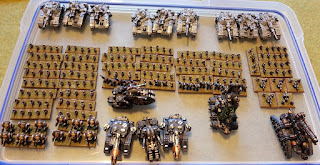 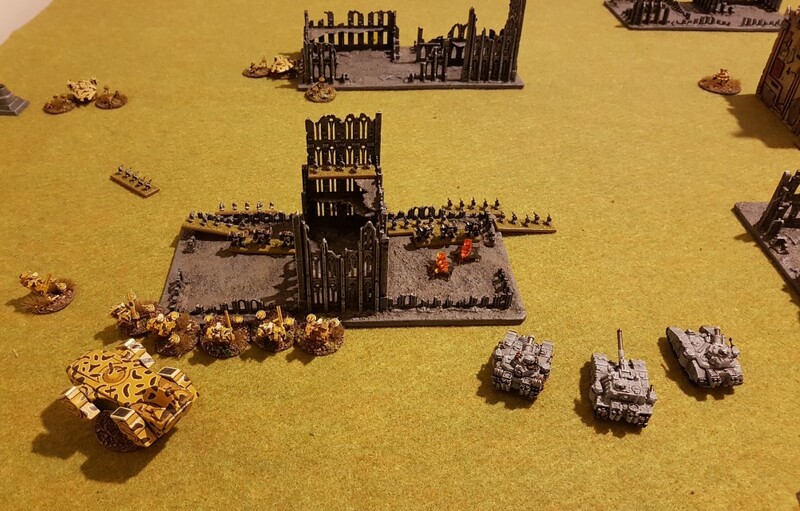 Andrew used his Viorla Tau with a heavy number of tanks. Here's the setup. 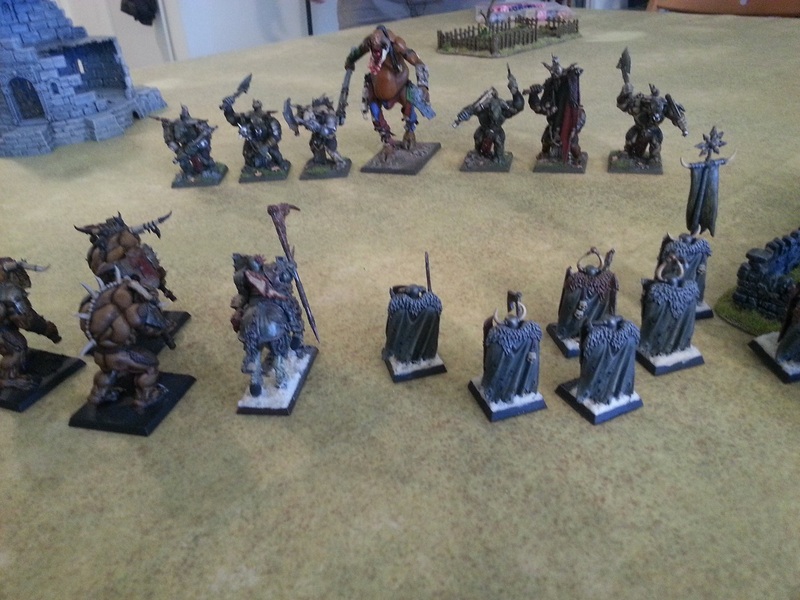 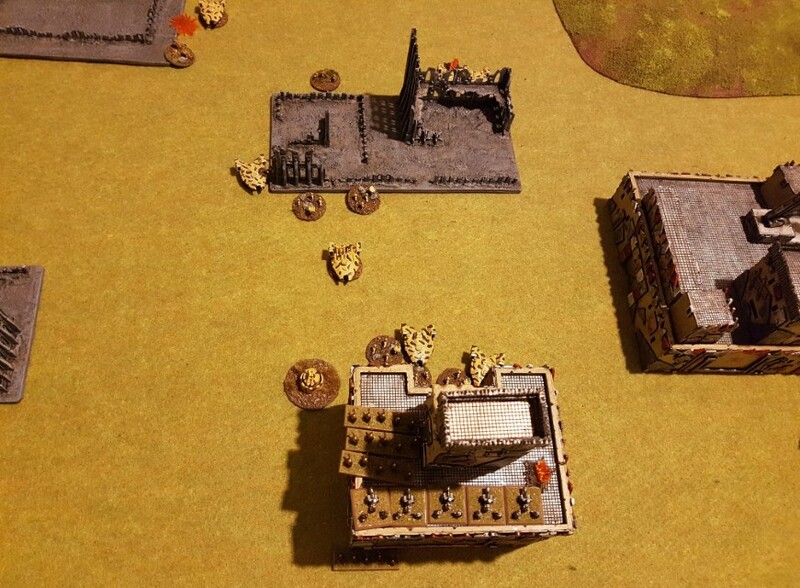 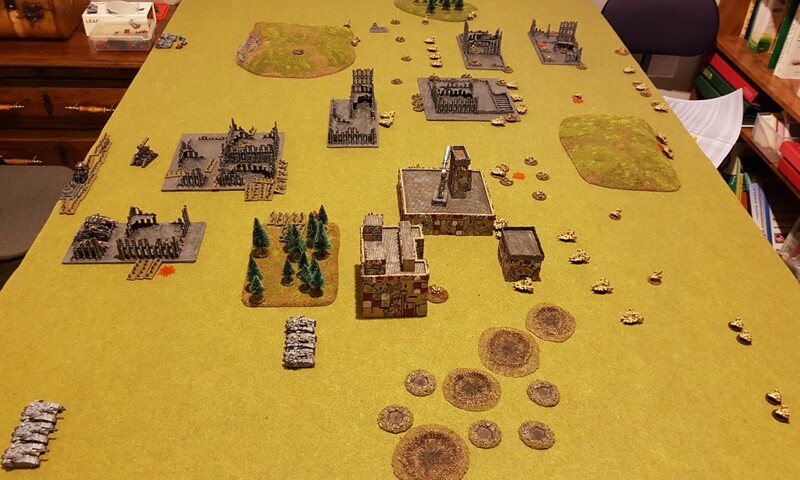 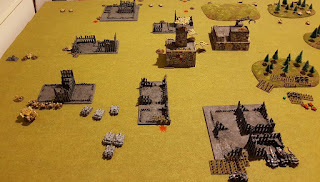 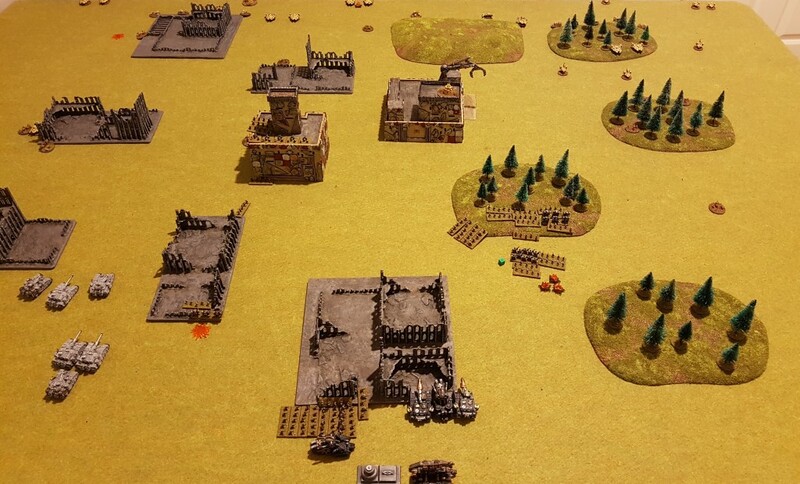 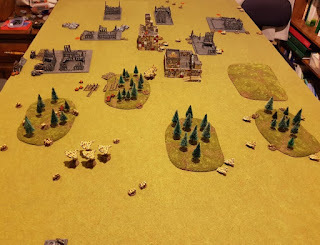 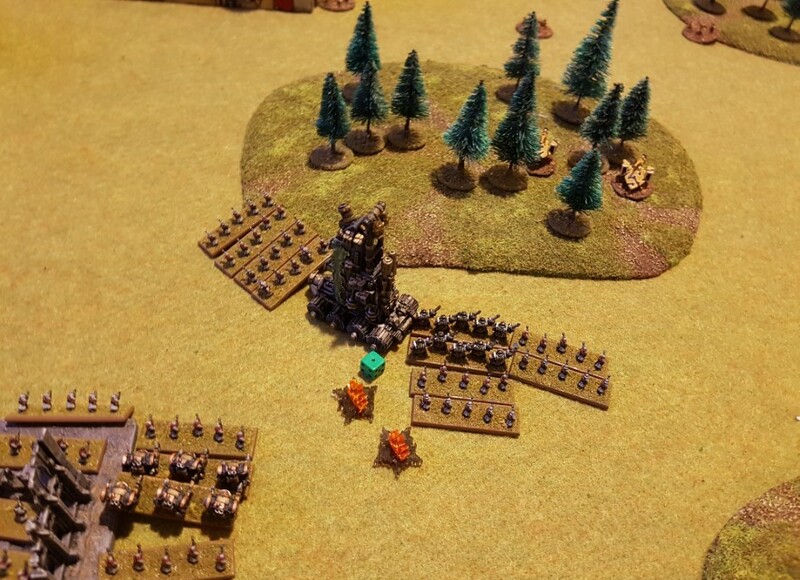 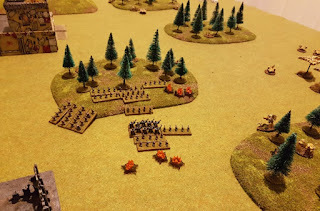 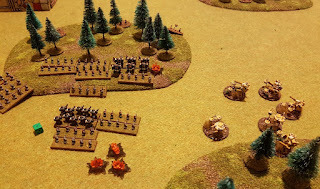 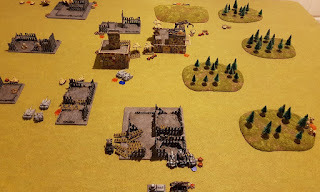 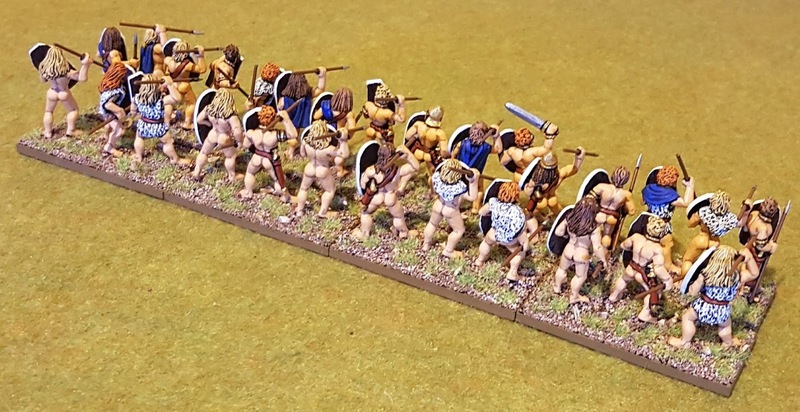 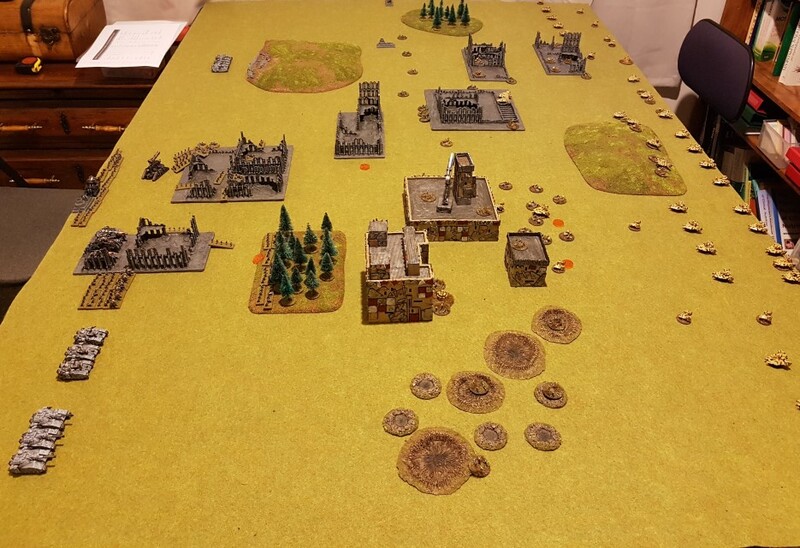 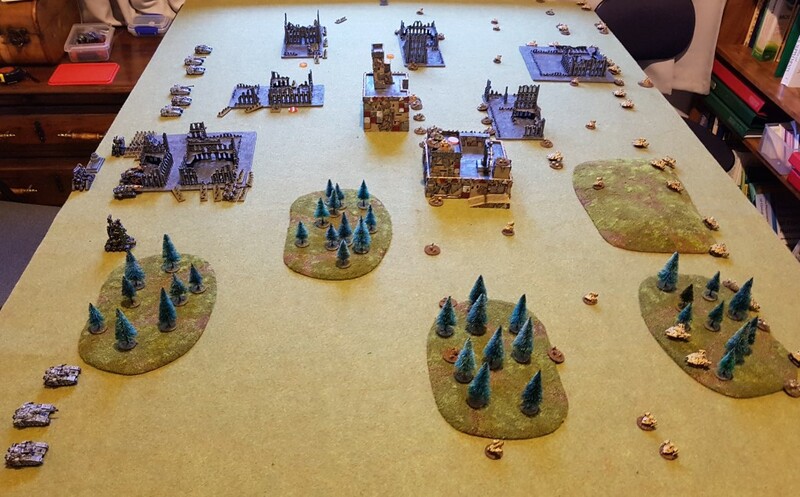 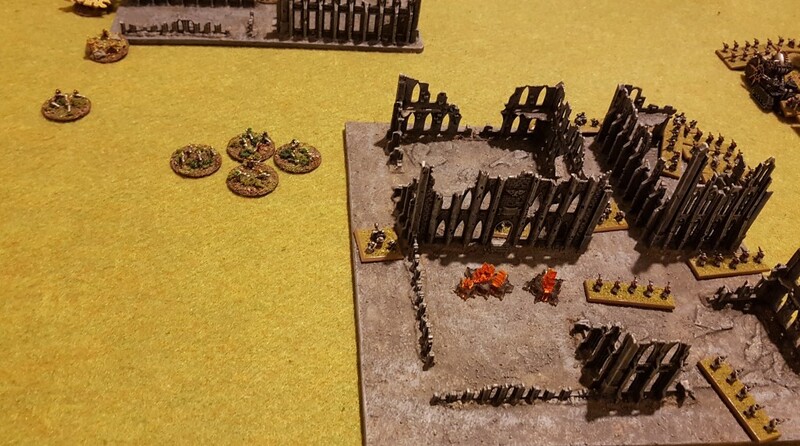 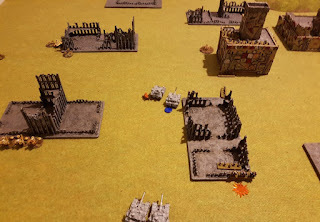 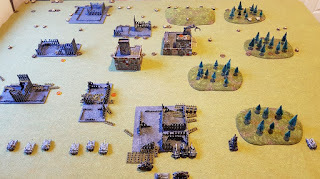 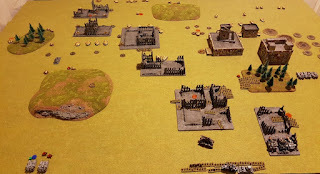 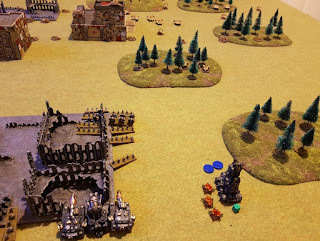 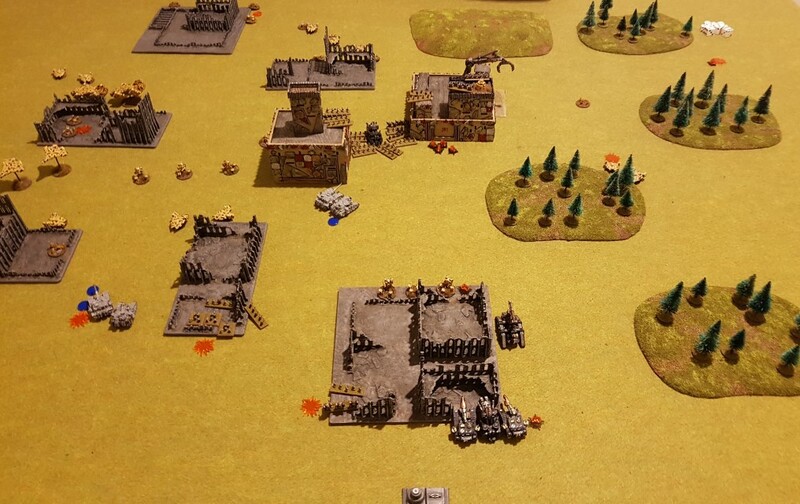 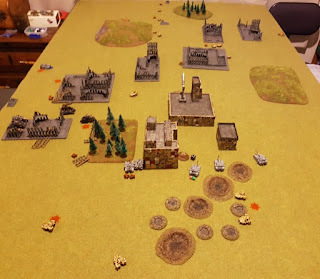 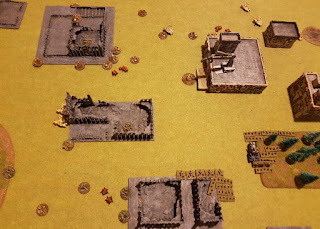 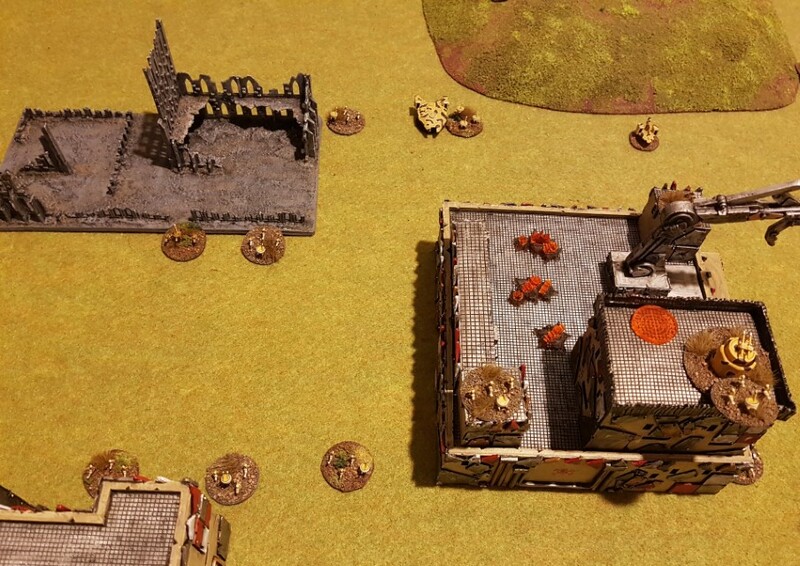 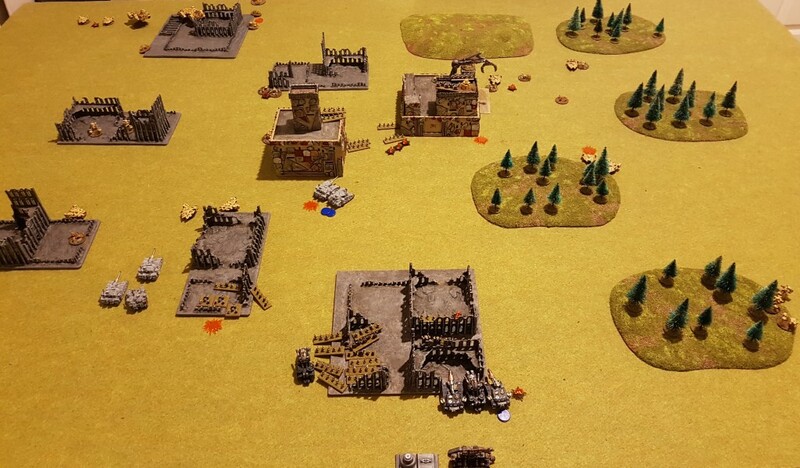 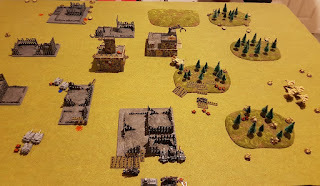 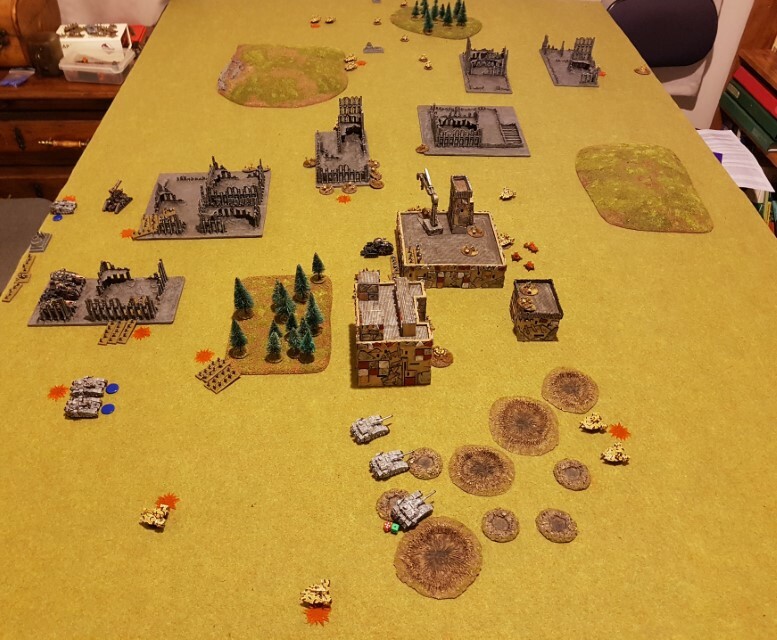 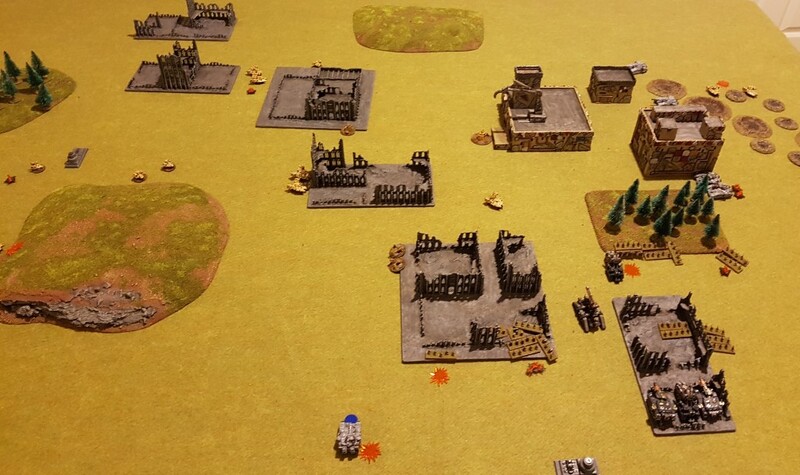 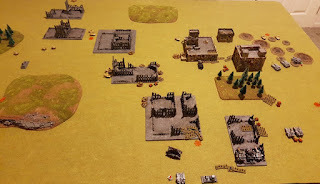 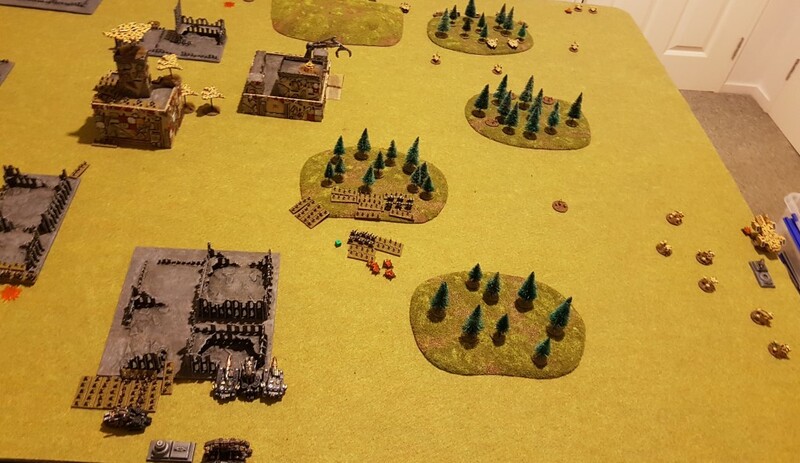 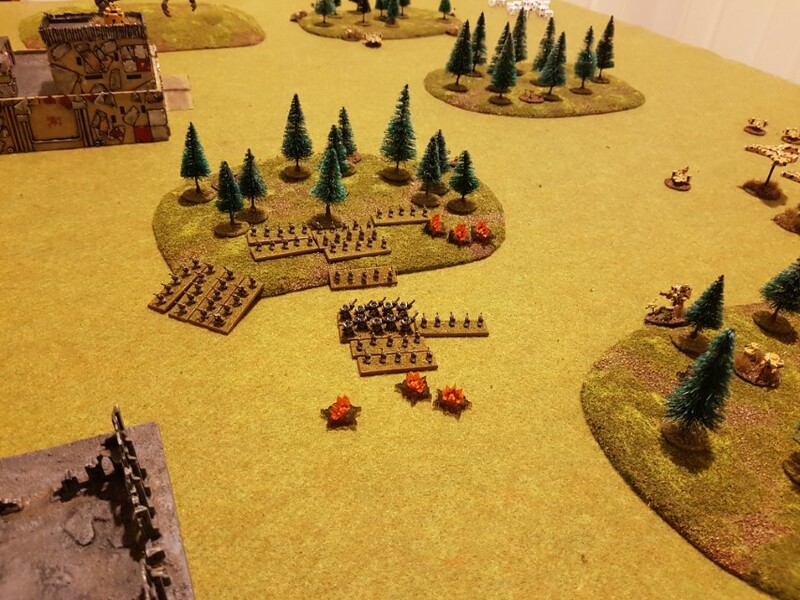 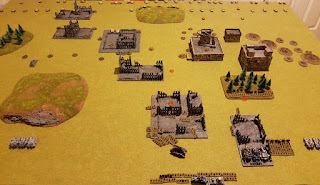 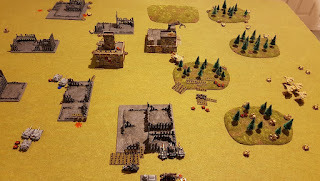 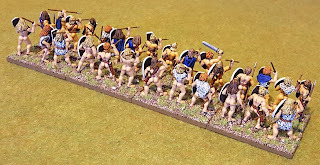 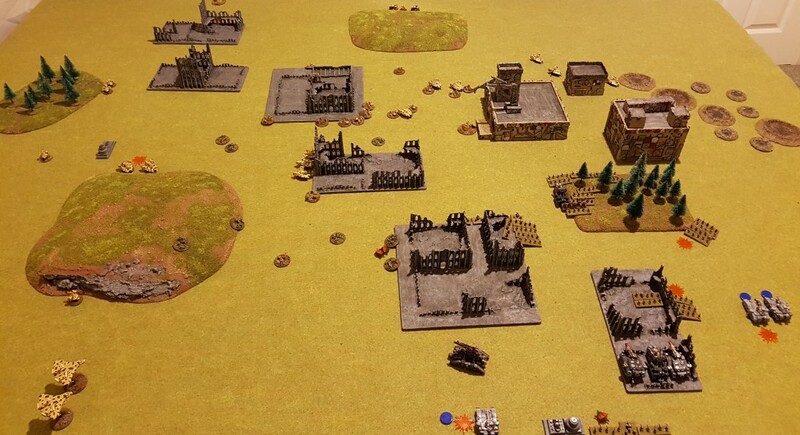 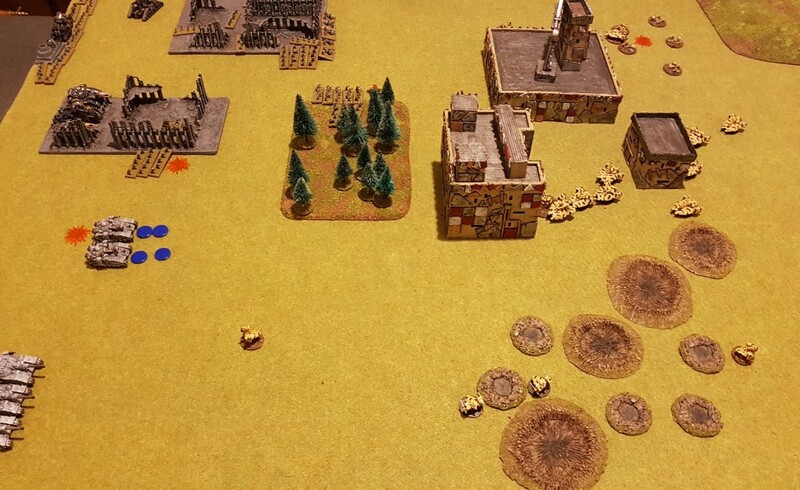 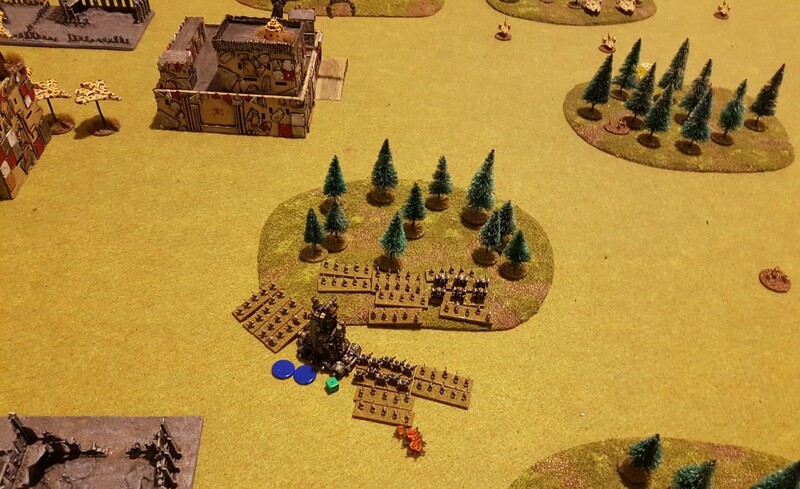 I am clustered near the ruins in the centre of the table though with some Minoris on the flanks. The Tau are spread out to avoid the artillery barrages, and with plenty of garrisons forward of the line. I win strategy roll and open up with the one shot Minoris Barrage wrecking one of the Tau formations and putting BM on two others. The Tau concentrate fire against my Plasma Destructor Ordinatus with co-ordinated fire, so that I end up just marshalling them to remove blast markers and restore shields. 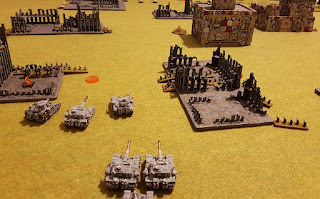 Thus they cancel out the firepower that had been just been thrown at them, but the Ordinatus are not able to do use their own guns in return. 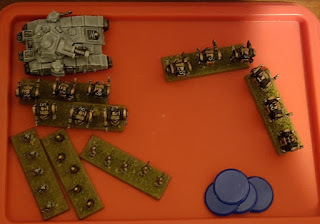 Given they are slow firing and can only fire every second turn I decide this is not a great disaster though. 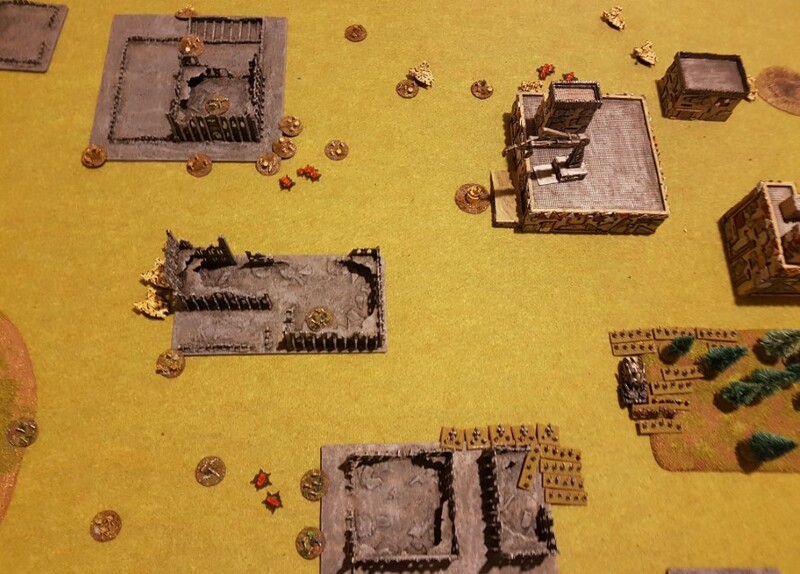 My Hypaspists engage in a firefight and wipe out a suppressed Kroot Formation in the centre of the table, and take one of the buildings. 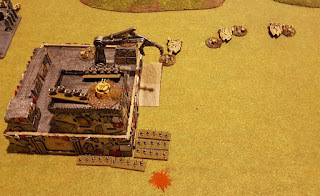 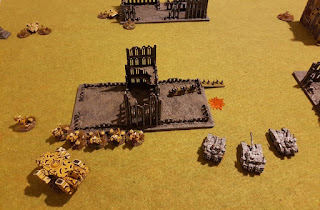 The Tau then concentrate fire on my left most Ordinatus formation stripping shields and breaking them, and the Tau Spacecraft arrives and misses with one shot, but destroys an Ordinatus with the other. 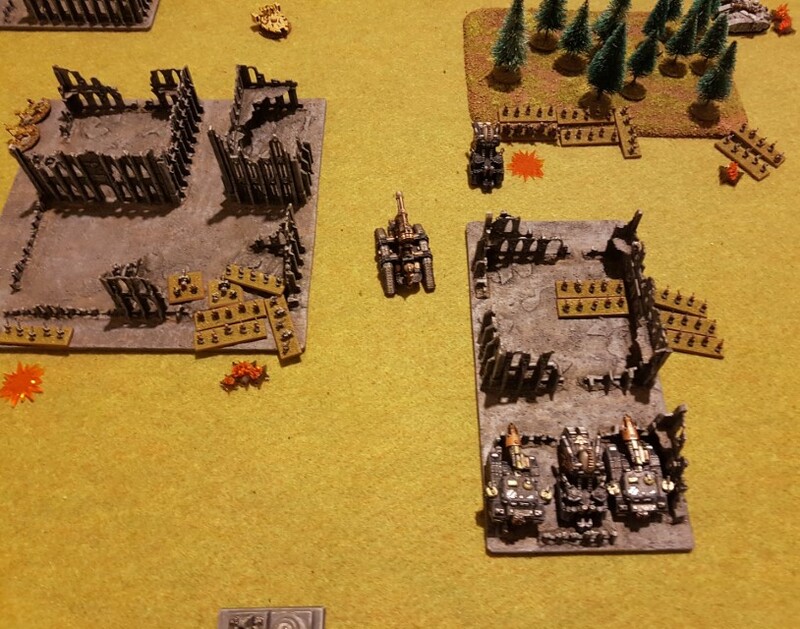 More fire is exchanged, with the Tau Fusion Hammerheads managing to break my lead Hypaspist formation and force it to retreat, and several more Tau formations being mauled. 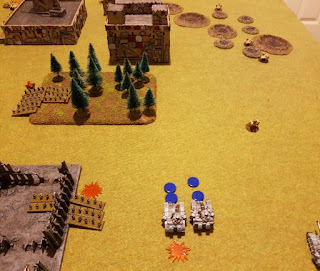 The Majoris wrecks a Hammerhead formation destroying two tanks. 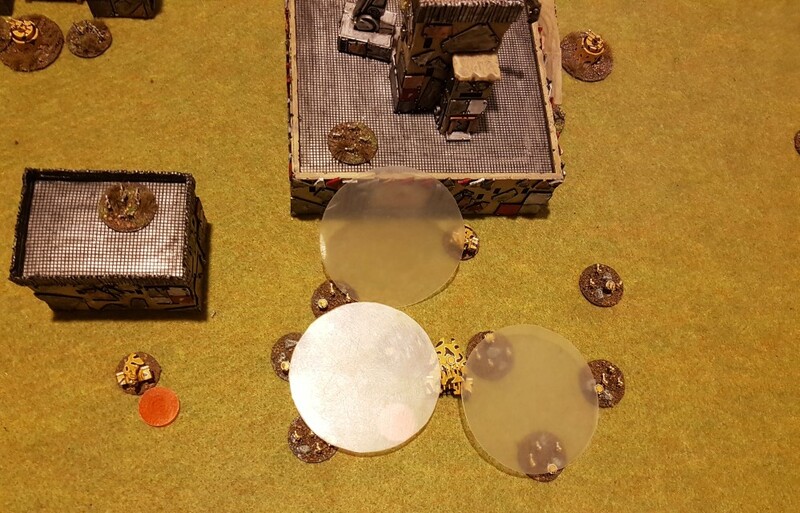 End of turn 1 losses. Note all the dead Secutors who had no luck with saves this game against Tau Fusion Hammerheads and Snipers! 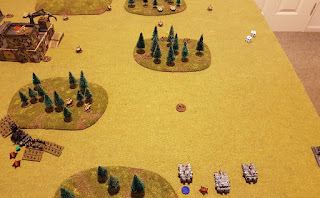 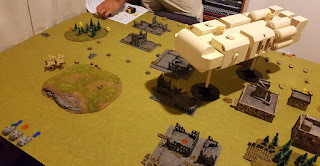 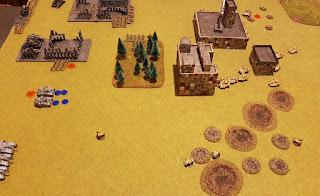 Tau win Strategy Roll, and launch a co-ordinated fire mission with Recon and two Hammerhead formations. 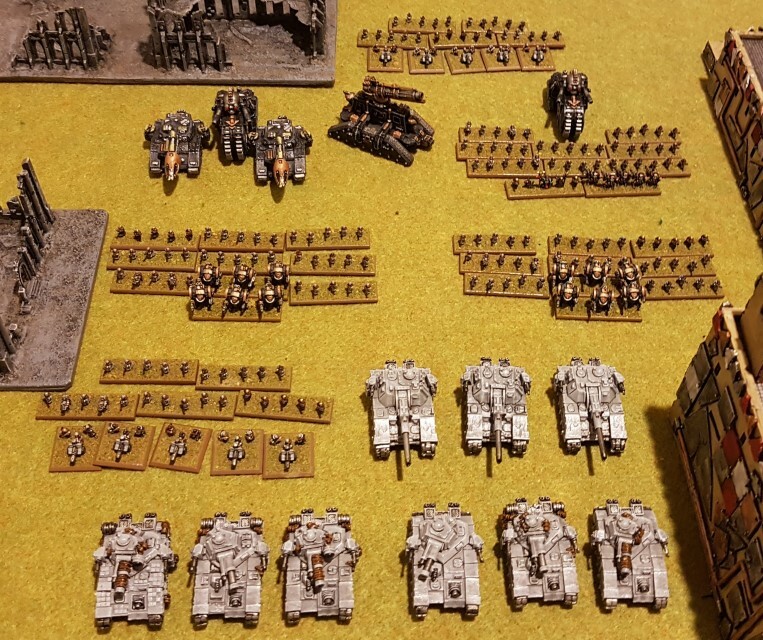 This breaks my lead Minoris formation and destroys one of it' number, and they fall back shields down. 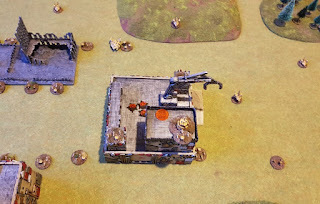 The Majoris fires again and wrecks another Hammerhead Railgun formation before it can activate, destroying two tanks. Hammerheads are a priority target given their threat to Ordinatus units. More fire is exchanged and Kroot sweep forward in a firefight breaking a Sagitarri formation, losing two of their own in the exchange. 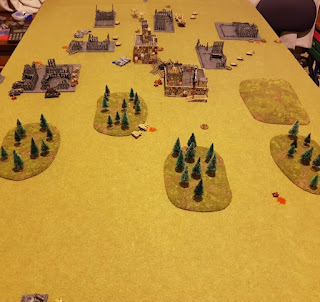 End of turn 2 before rallies. 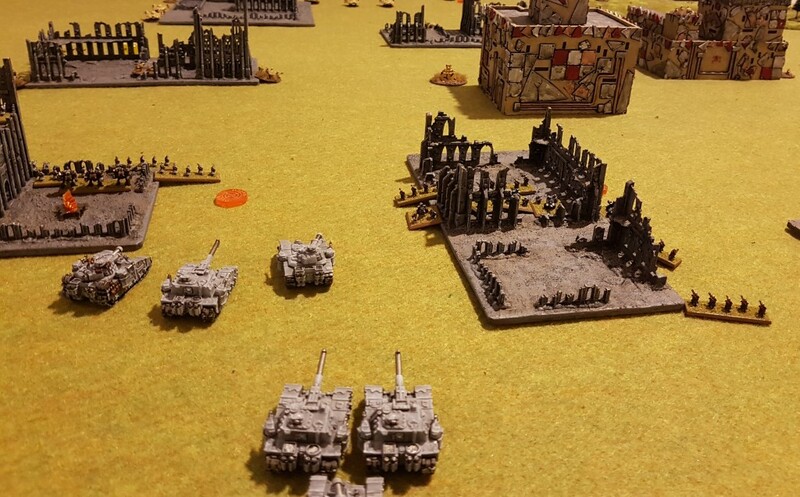 Below the Plasma Destructors have advanced and fire two of their number wiping out a Recon formation, their massive guns being an expensive and too heavy option for the matchup in this game! The centre showing the battle for the objectives and buildings here. 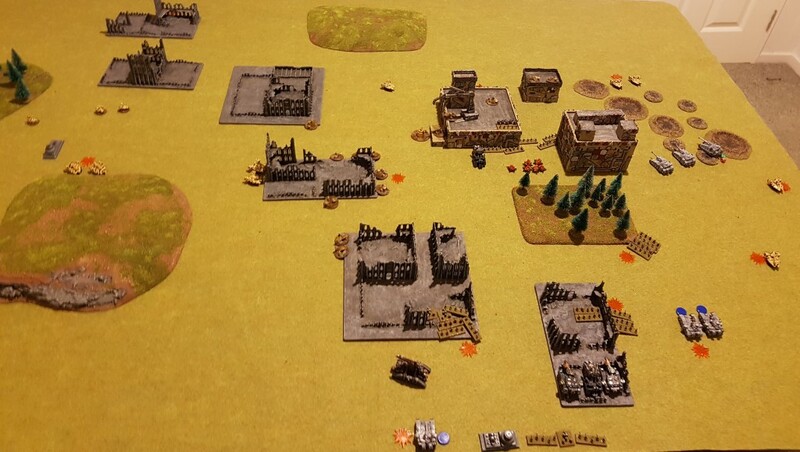 Both sides infantry continue to take heavy losses in the built up area as buildings are contested, and locations change hands. 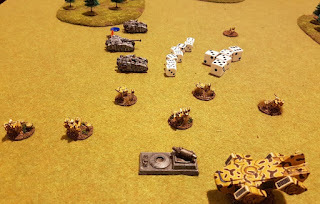 The Plasma Destructors advance wrecking more Tau tanks though only one can fire this turn. Ordinatus artillery continues to take a heavy toll with each barrage rendering a Tau formation combat ineffective. 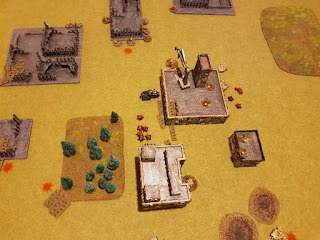 A look at the situation in the centre. 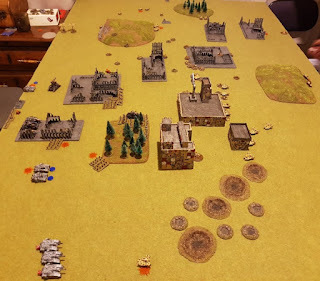 My Supreme Commanders formation has advanced to contest the central building but a Tau Sniper takes out my Magos so no more rerolls! 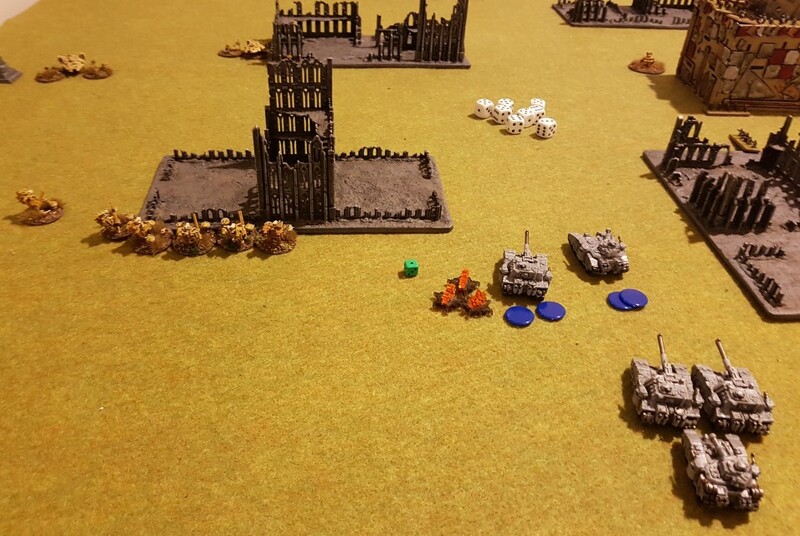 Tau have been throwing forward broken formations to slow the Skitarri advance and prevent me winning on objectives. 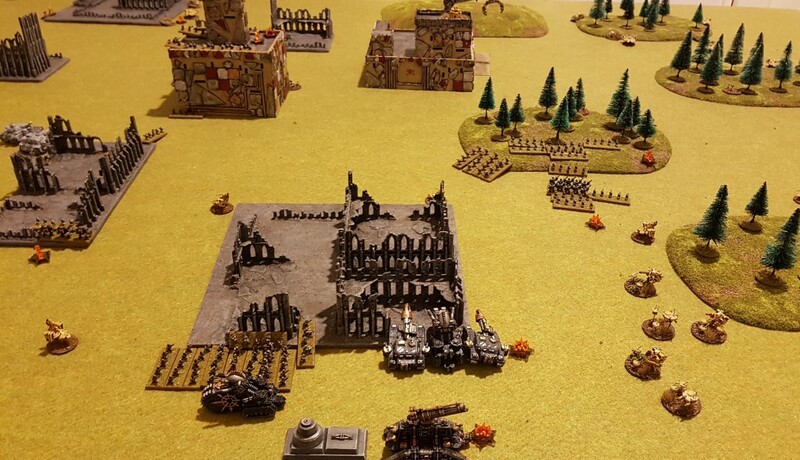 Even the Tau Command formation takes on this role, and their Supreme Commander is also killed along with his entire formation. 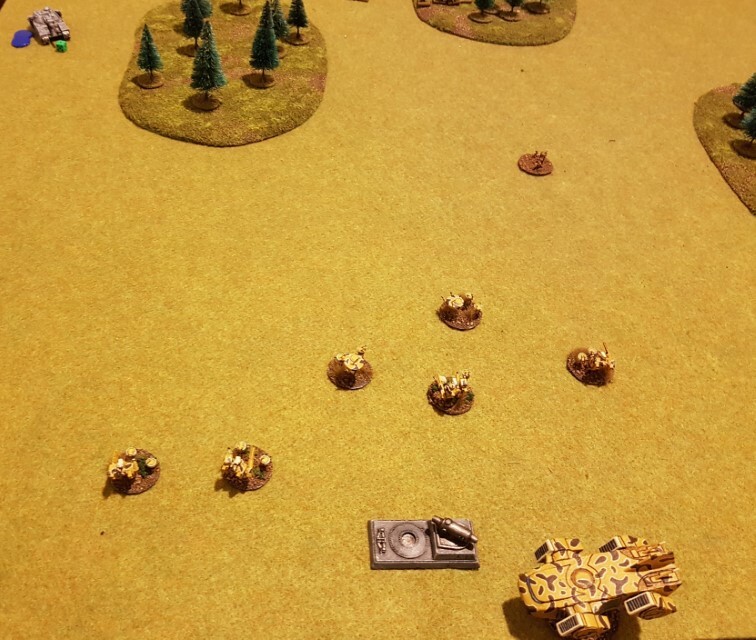 The Minoris Quake Cannon formation manages to get lucky and shoot down three Barracuda with its AA just to add insult to this loss. 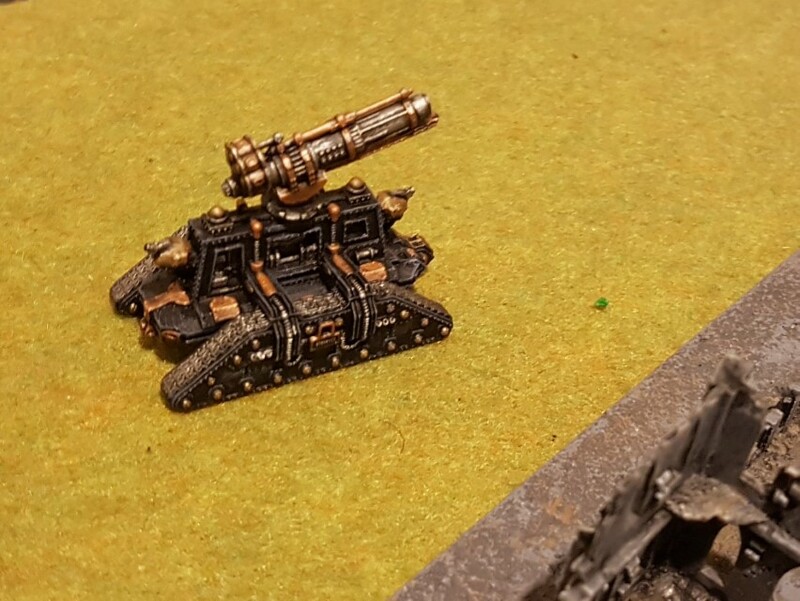 The Majoris is out of barrage ammo, so drives forward to use its hull weapons, which still helps out against broken Tau formations. 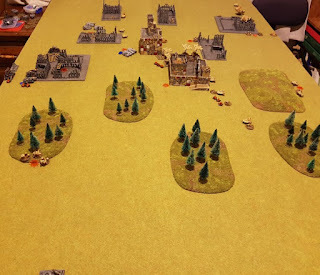 Turn ends and I have the 'Break Their Spirit' victory condition but nothing else, and the Tau have "Take and Hold" but no other victory condition. 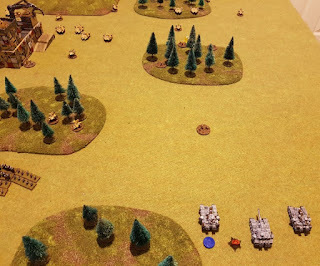 Game fails to go to a turn 5 and so we go to Victory Points. 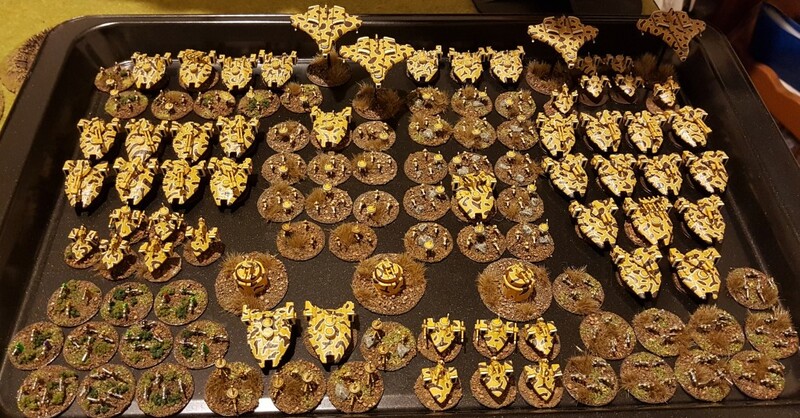 Skitarri have destroyed 2887.5 points of Tau. 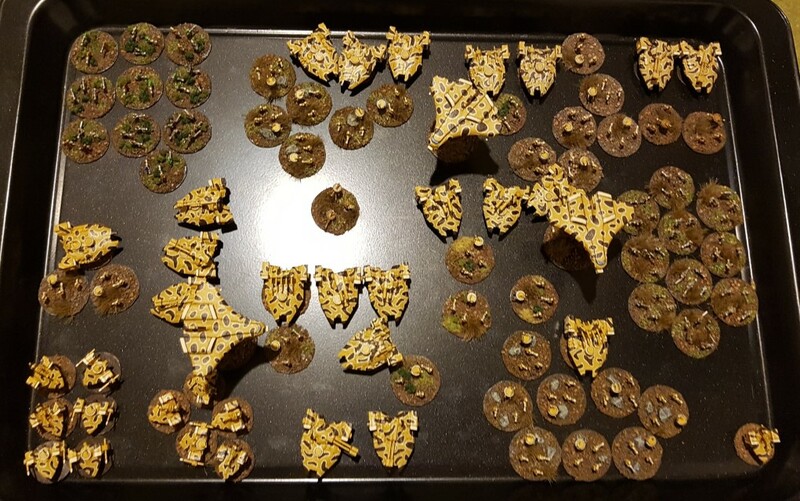 Tau have only destroyed 1362.5 of Skitarri so a win to Skitarri. A protracted battle of attrition, but the Skitarri forces managed to out-attrition the more lightly armoured Tau in the end. 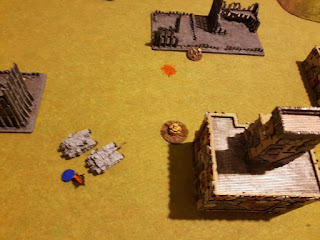 One point in the Tau favour in this battle was that the Ordinatii firepower (e.g. 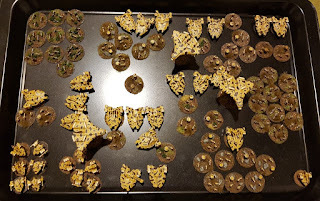 Plasma Destructors) was often overkill and thus inefficient against the 'pop-corn' style list used here with 18 Tau formations vs 10 Skitarri. 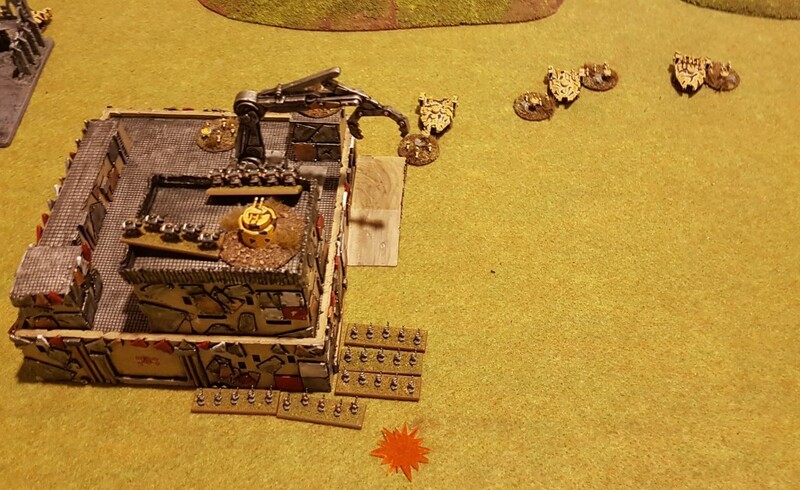 The artillery Ordinatii were reliably destructive and didn't fail an activation in the game which added to that effectiveness. They were also so well protected by shields and being at the back of the table that the Tau prioritised targeting the more easily reachable Ordinatii which could be markerlighted/crossfired. 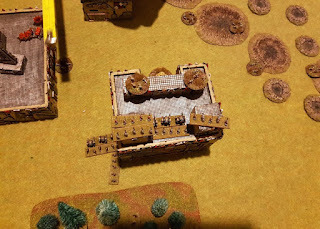 This was probably a wise move as the firepower from these was also more immediately destructive in power, though also much more vulnerable and challenging to employ as effectively.